That stubborn fat that pushes out over your waistband can be frustrating. The lower abs are a common "trouble zone" for many women and men and fat in your midsection can be some of the hardest to lose. If you still have lower belly fat when you follow a generally healthy lifestyle, a few tweaks might help you out; otherwise, you might consider adjusting your expectations for your physique. Cutting calories from your diet can help you lower your overall body fat levels, which includes the fat covering your lower belly. Start by using an online calculator to estimate how many calories you need to maintain your weight; then subtract 500 to 1,000 calories to get your new target calorie intake. Cutting this number of calories will allow you to lose 1 to 2 pounds each week, which is a safe and sustainable rate of weight loss. Just don't eat less than 1,800 or 1,200 calories for men and women, respectively; if your intake goes below these minimum levels, you risk nutrient deficiencies and, ironically, impaired weight loss as your body goes into "starvation" mode. Remember, as much as you'd love to pick and choose where your body loses fat, that's not how it works. When you create a calorie deficit, your body starts oxidizing fat to close the energy gap. But it burns fat all over your body, not just from certain areas. Depending where you tend to store fat, your lower abs might be one of the last places to look toned, but, by lowering your overall body fat, you're working toward flatter, more toned lower abs. Don't rely on estimates to figure out how many calories you're getting. Research shows that sometimes people underestimate how much they're taking in, especially when "eyeballing" their portion sizes and guessing their calorie intake. One study, published in a 2011 issue of Obesity, found that people tend to underestimate their calorie intake at restaurants, even if the restaurant includes nutrition labels that provide the calorie content for their dishes. Another study, published in a 2013 issue of PLoS One, noted that people are especially prone to underestimating calories when they pair an unhealthy meal with healthy food. So if you're serving a high-calorie pasta dish, for example, with a side salad, you're more likely to think you're eating fewer calories than if you served the pasta dish alone. If you're already following a healthy diet, double down on recording your food and drink intake, as well as weighing or measuring your portion sizes. Even if you used to measure all your portions -- so you have a general idea of what a portion looks like -- you might unwittingly serve more than a standard portion size. Those extra calories can eat away at your calorie deficit, which prevents you from losing weight. Challenge yourself to record everything you eat and drink for at least a week, and measure or weigh everything in your diet. This readjustment might help you achieve the calorie deficit that you need to shed lower belly fat. If you're filling up on foods high in sodium, which includes processed and fast foods, along with some healthy dishes like soup, whole-wheat bread and cottage cheese -- you might notice more bloating in your lower belly. Sodium helps your body retain water. That's a good thing when you're following a relatively low-sodium diet -- you rely on that salt to help maintain healthy blood pressure, for instance -- but it can cause bloating when you get too much salt. Instead, fill your diet with naturally low-sodium foods, including fruits, vegetables and lean protein served without added sauces or packaged marinades. Avoiding processed and packaged foods has another weight loss benefit; since these foods are often high in calories, cutting them out in favor of less-processed fare can make it easier to create the calorie deficit you need to slim down. Strength training might help tighten up your midsection, especially if you're already thin. While abdominal exercises don't burn many calories, they can make your midsection appear more toned, which might reduce your lower belly fat. Strengthening your core also improves your posture. That might make your abs look flatter if you currently have an anterior pelvic tilt -- or a "swayback" -- that makes your stomach and lower abs stick out. Improving your posture will give the appearance of flatter abs, which makes you look thinner. Strengthen your core with planks and side planks, which tone your sides and your transverse abdominals -- the corset-like muscle that goes around your midsection. As you get more advanced, try more difficult plank modifications -- try putting your elbows or feet on an exercise ball while you hold plank position, or jump your feet in and out for plank "jumping jacks." Incorporate woodchops and twists into your routine to cinch your waistline, as well. Pair your strength training routine with cardio, which burns calories to help you shed fat. Don't feel tied to the treadmill, though. Try a boxing, martial arts or a Zumba class that will not only shed calories but work your core, so you're toning your abs as you burn fat. If you've adjusted and tweaked your diet and you've incorporated abdominal toning workouts into your routine but you still have lower belly fat, you might reconsider if losing it all is a realistic goal. You don't need perfectly flat abs to be healthy and happy, and slimming down to reveal your 6-pack might require sacrifices that leave you feeling tired or unhealthy. For example, achieving perfectly flat abs might require avoiding social situations where you eat, giving up hobbies or time with your loved ones to spend time at the gym, and hours spent measuring and tracking your diet, as well as preparing healthy foods. Find the balance that helps you lead the happiest, healthy life possible, even if it means living with a small deposit of fat on your lower abs. A healthy lifestyle you can stick to and enjoy will have longer-term results than a more drastic plan that isn't sustainable. PLoS One: Underestimating Calorie Content when Healthy Foods are Present: An Averaging Effect or a Reference-Dependent Anchoring Effect? 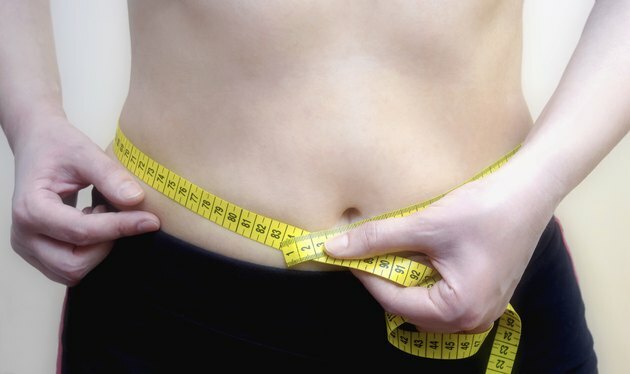 Can You Get Rid of Belly Fat if You Are Skinny?